Time bomb - The Chip's Challenge Wiki - The Chip's Challenge Database that anyone can edit! This article is about the CC2 item. For the 131st level in CCLP2, see Time Bomb (CCLP2 level). 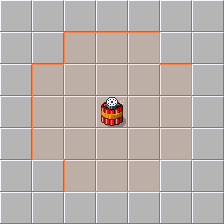 The explosion is a 5x5 square centered at the time bomb, excluding the corners. The explosion will destroy all tiles which are on the top layer inside its radius except for steel walls, sockets, logic gates, and wire. Assuming there is only floor underneath the tile, dirt blocks, directional blocks, monsters, and active time bombs will leave fire when destroyed, ice blocks will leave water when destroyed. Objects on top of clone machines will be destroyed, but the clone machine itself will be unharmed. Canopies will be destroyed, but whatever lies underneath will be unharmed. If a trap, a clone machine or a flame jet is destroyed by a time bomb, any buttons linking to it will stop working entirely; they will not be "redirected" to the next trap, clone machine or flame jet. If a monster, a bowling ball or a player mimic drops a time bomb, it will not be activated. Instead, it can be picked up again by Chip or Melinda and dropped elsewhere. An activated time bomb will kill Chip or Melinda if they touch it, and can be destroyed by a bowling ball. It can also hold down buttons. The time bomb is the only item that can have its own inventory. After being dropped by Chip or Melinda, it inherits a copy of the player's inventory, both keys and locks. It cannot use keys (i.e. it cannot open locks) but it can use the items (allowing it to turn on wires, pull blocks or survive in water). Under ordinary circumstances, this will have no visible impact; the time bomb essentially behaves like a dirt block with an inventory for its brief existence. However, there are some special cases, detailed below. If a time bomb is dropped while on force floors, and the player doesn't have suction boots, the time bomb will slide, following the force floor path. It will also slide on any ice tiles and teleports it encounters along the way. The countdown will only begin when the time bomb has stopped sliding; as a side effect, if the slide leads to an acting wall, the countdown will never begin. Time bombs will not slide if dropped directly on ice, however, nor if the player has suction boots when dropping it. A time bomb will be destroyed in water (unless it has flippers), fire and open flame jets (unless it has fire boots), slime, bombs and green bombs. It can slide onto gravel but dirt is an acting wall to it, regardless of whether it has hiking boots or not. It can also enter fake green walls, and can be affected by no signs. Transmogrifiers have no impact on it, and it cannot enter clone machines or pick up other items.